One of the most exciting signees on Future’s Freebandz label, Cleveland riser Doe Boy wins fans with his hard-hitting flow and street witticisms. Declaring his intentions to blast off from regional stardom to national notoriety, Doe Boy announces 88 Birdz, his upcoming project. Executive produced by Young Thug, 88 Birdz is a revealing portrait of Doe Boy’s life, touching on his troubled childhood, reflecting on his recent prison stay, and illustrating his aspirations to reach the upper echelons of the rap game. 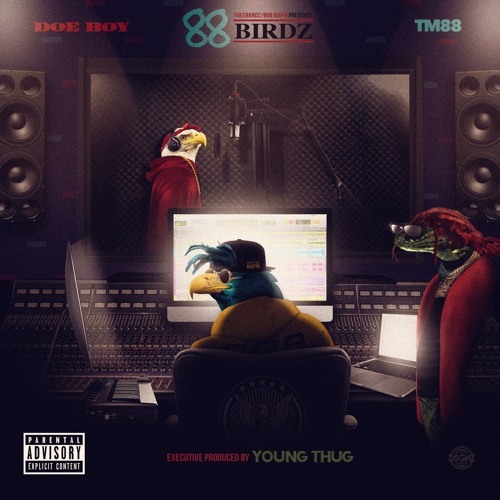 Distributed by StreamCut, 88 Birdz is an impressive effort, as Doe Boy masterfully switches up his flow to match the slithery trap beats by 808 Mafia’s TM-88 (Lil Uzi Vert’s “XO Tour Llif3,” Future’s “Codeine Crazy”), who produced several tracks on the mixtape, among others including Zaytoven. 88 Birdz arrives on August 10th. To accompany the announcement of the upcoming mixtape, Doe Boy shares “Slimey As It Get,” the tape’s first single. Riding an off-kilter, burbling instrumental from TM-88, Doe Boy showcases his understated facility with melody, switching on the auto-tune to accentuate his locked-in cadence. Accompanied by Young Thug, who populates the track with bizarrely entrancing ad-libs, gorgeous harmonies, and a wavy new verse. Premiered by Billboard, “Slimey As It Get” makes a bold statement as the opening track on 88 Birdz, foreshadowing Doe Boy’s versatile and restlessly creative approach to rap. Please contact Michelle for more info.